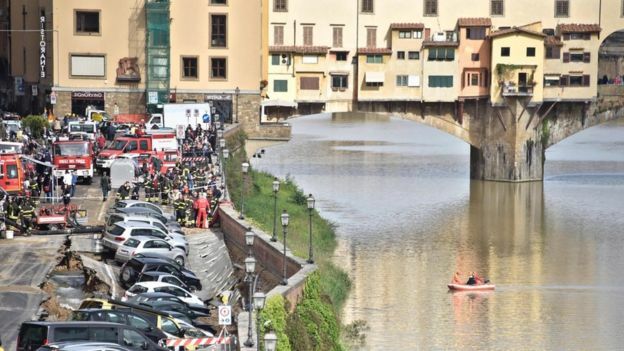 The small attic apartment that Swietlan Kraczyna shared with his wife and baby daughter in Florence did not have heating, but it had a great view of the Arno river. 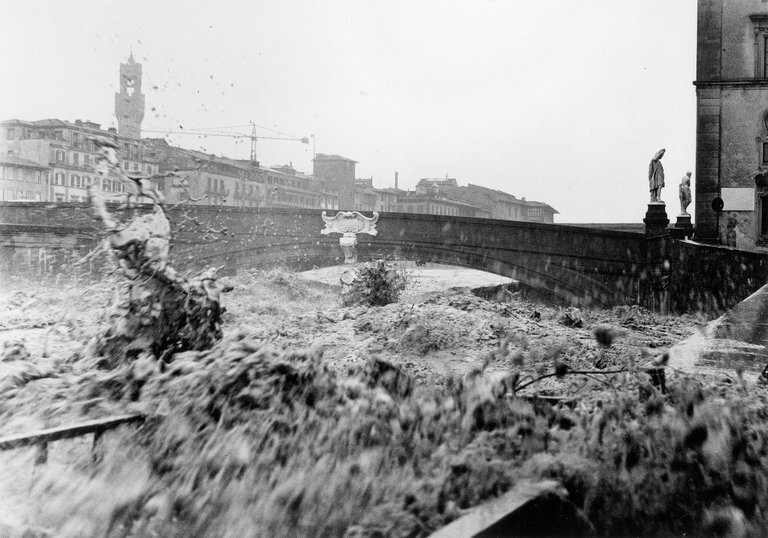 It was nearly dawn 50 years ago on Friday, when the immense sound of water rushing through the three arches of the Ponte Santa Trinita made the artist, who usually worked at night, look out the window. 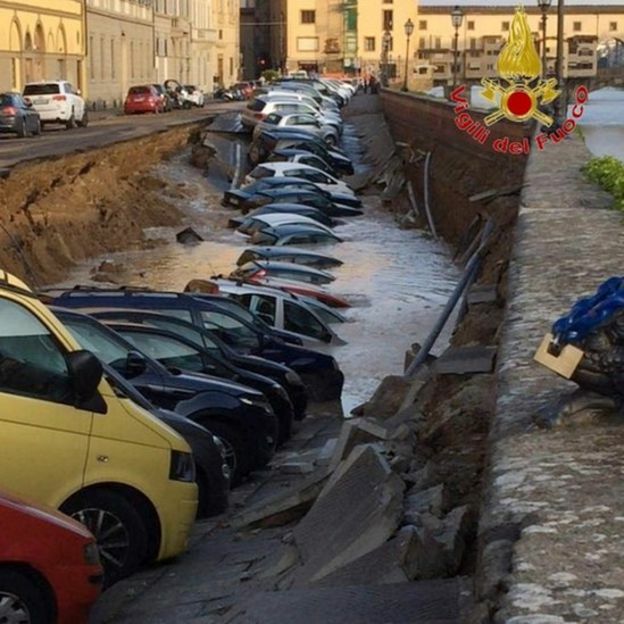 What followed – the great flood of Florence – would be remembered for decades as the worst natural disaster to lay siege to the city at the heart of the Renaissance. 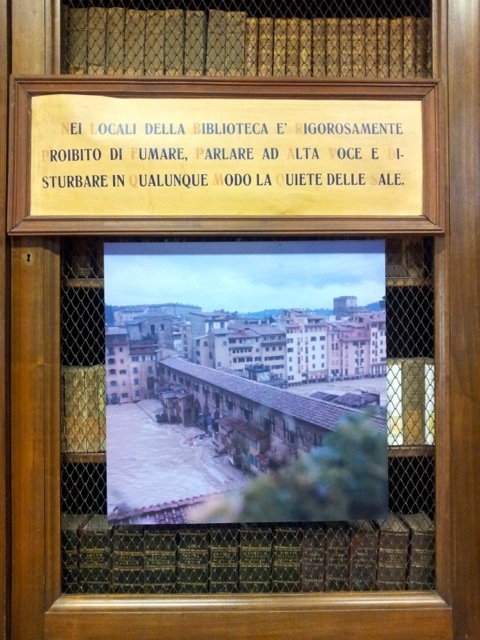 Dozens of lives were lost, great works of art destroyed or nearly destroyed, and a million books in the city’s low-lying Biblioteca Nazionale were submerged. Kraczyna, who was living on a shoestring at the time and worried about having enough food for his family, grabbed his camera and headed for the streets with just 16 shots left in his roll of film. FLORENCE, ITALY — In early morning light, the low buildings lining both sides of the Arno River here glow in their myriad shades of ochre, like the shallow river itself, which flows calmly through the city. When I was here on Nov. 4, 1966, with my husband-to-be on our first trip to Europe together, it was quite a different sight. It had rained for days, and, totally saturated, the water table rose up; the river, coursing angrily with a release from an upriver dam, overflowed its retaining walls into the streets. Stranded in our hotel along the river, I looked down from a second-floor interior balcony and saw that the water had risen frighteningly to the ceiling of the lobby. I asked for two candles, two bottles of water and a couple of packets of breadsticks. Several years ago I came across an image, in color, of the flood of 1966 that was credited to a B. Kolrab. After some on and off digging around, I finally tracked it down as the work of architectural photographer Balthazar Korab (more on that side of the story soon). 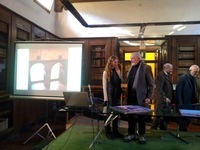 The thing that intrigued me most about that particular color photograph however was what I learned after this blog helped discover and publicize the color photos of Joseph Blaustein - that most Florentines are under the impression that color photos of the flood did not exist. 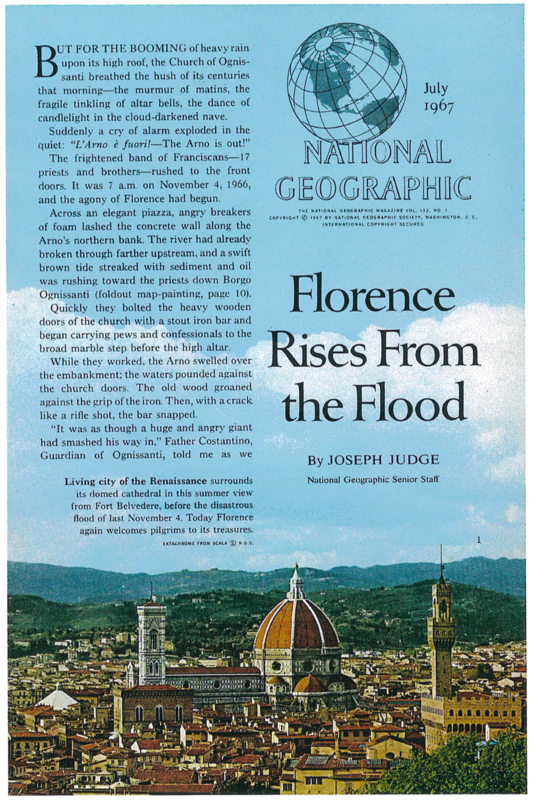 As this weeks ends on the 50th anniversary of the epic deluge of Florence, I will be posting more images and excerpts from the article, and some images from the Korab archives, as well as news of the coverage of this years events. A water main break seems to be the culprit. 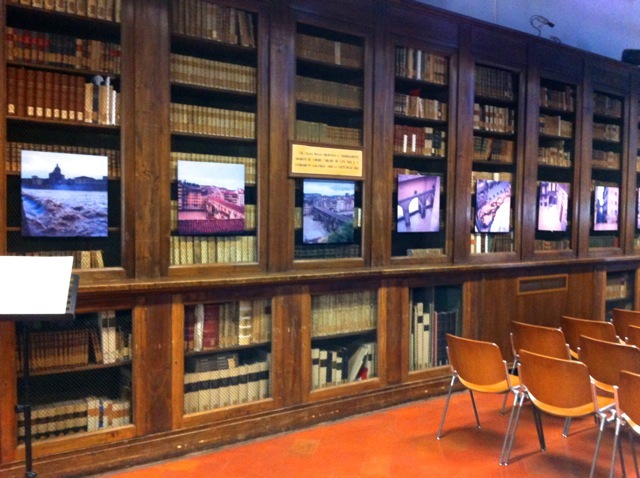 Pictures from the exhibit "Tutti i color dell'alluvione"
The photos are supposed to remain on display in the library until the end of the year. Thanks to Naomi at art925 and Paolo at Centrica. 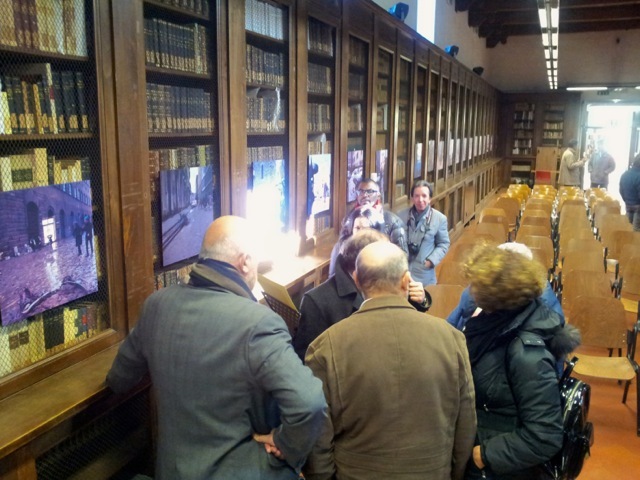 This Thursday, November 28th (Thanksgiving day in America) at noon, the City Archives of Florence (L'Archivio della città) will present what are believed to be the only color photographs of the 1966 Flood of Florence: Tutti i colori dell'alluvione. 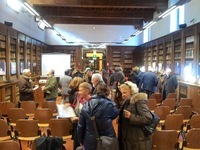 (The exhibit itself will take place in the Biblioteca delle Oblate in the Sala Consultazione Sezione Storica, the library is across the street from the archive - PDF of the invite). 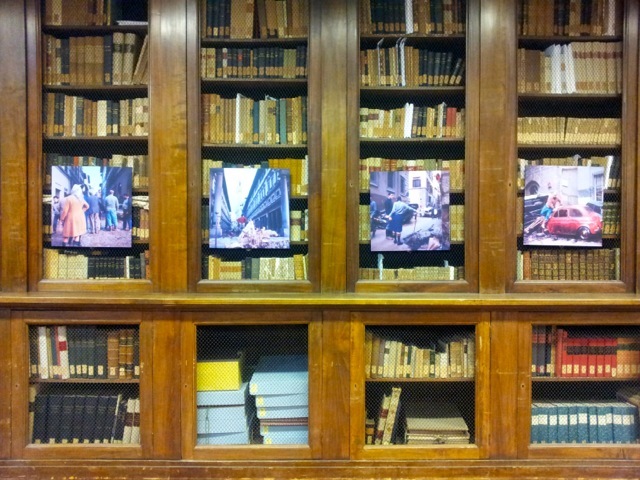 The images were taken by advertising executive Joseph Blaustein while on a trip to Italy with his then pregnant wife. Luckily for all of us, Joe just happened to have a couple of rolls of color slide film on him (fairly expensive and rare in 1966). Virtually trapped in their pensione near the Arno (like most everyone in the city), Mr. Blaustein captured images from the pensione windows the night of the flood, and then during the next morning and next day made his way around Florence on both sides of the Arno and took these amazing, historically significant, one of a kind photographs. 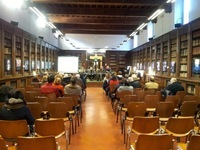 I had started this website (Florence-Flood.com) during the second year I lived in Florence (which was the 40th anniversary year of the flood, 2006), and since its inception (and probably due to it being in English) I have received correspondence over the years from many people who were either in Florence during the flood or people who came after and were called "mud angels" - volunteers from all over the world who helped clean and restore books and art works. Joe Blaustein is one of these people who originally contacted me via this website, and by email he was able to share his story (and what a story - more of which is here) with me and finally some of his images. 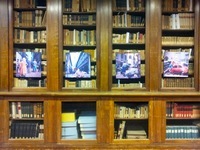 To make a long story (from our first contact to the exhibit opening Thursday will be more than 3 and a half years!) very much shorter: via my friends and contacts in Florence, and especially with the help of Paolo De Rocco of Centrica, I was able to get a first meeting and present some of the photos (scanned slides at this point on my laptop) to Carlo Francini who heads the UNESCO office for the Comune di Firenze. 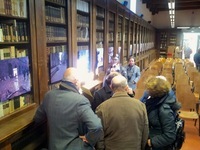 Mr. Francini then brought the images to the attention of the Archivio della città and eventually we all met (Mr. Blaustein who was in Tuscany at the time on a teaching trip, Paolo De Rocco, Silvia Gallini and others in Mr. Blaustein's party) with Luca Brogioni and his colleagues at the City Archives of Florence in early 2013. The city archive at that meeting enthusiastically accepted Joe's generous offer of donating his slides to the city of Florence, and started the preparations for the first public showing. 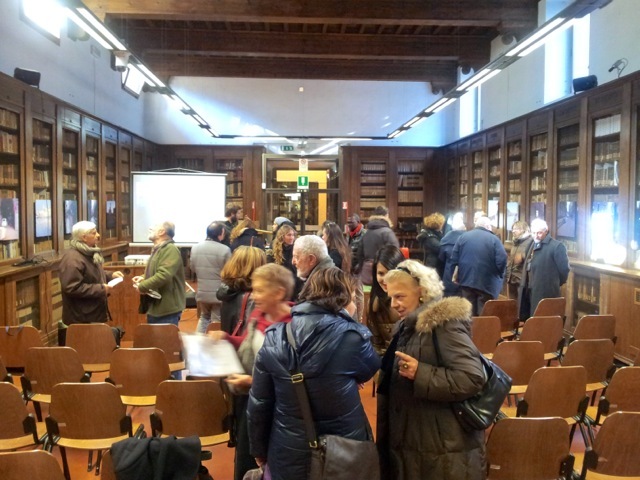 Sadly (for me), this has finally all come together and I wil not be able to attend as I left Florence in June of this year! 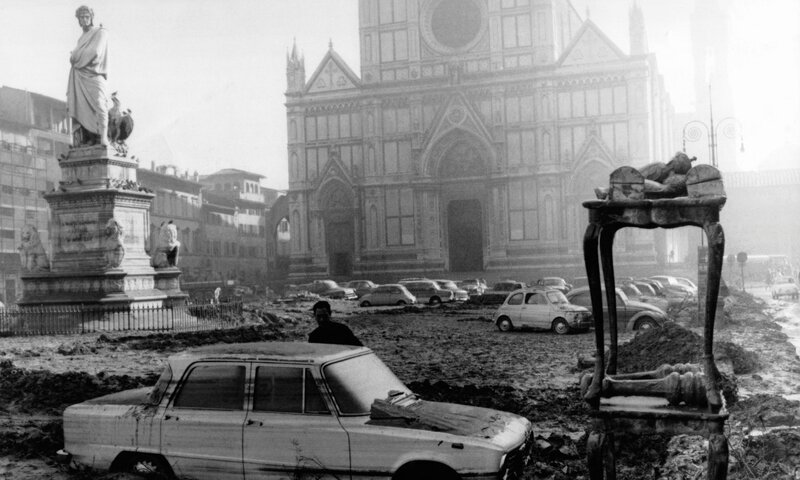 I hope one day to return to Florence and see Joe's photos exhbited somewhere - maybe in 2016 for the 50th anniversary of the flood. 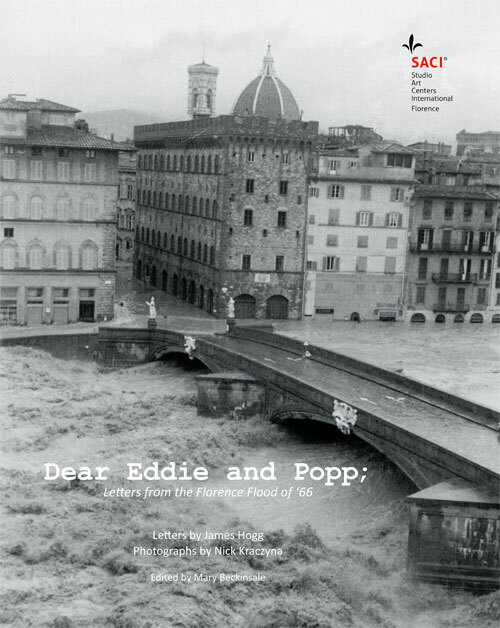 A SACI publication, Dear Eddie and Popp: Letters from the Florence Flood of ‘66, includes letters written by American artist and designer, James Hogg, who witnessed the effects of the flood. These numerous, typed letters written to his father-in-law are paired with photographs by Nick Kraczyna. We are most grateful to Giacomo Hogg for allowing us to publish his father’s letters and to Nick Kraczyna for allowing his remarkable photographs to illustrate these letters. Today is the 47th Anniversary of the 1966 Flood. 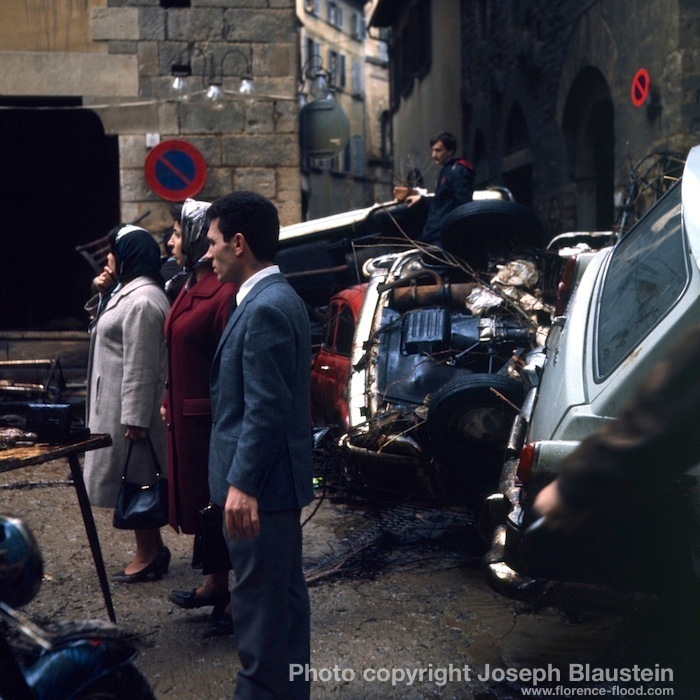 We were hoping to be in Florence at the opening of an exhibit of photographs taken by Joseph Blaustein - what we believe are the only color photos from the morning after the flood. Unfortunately the day has come and the exhibit was not organized in time - it is still supposed to happen, and may happen in just a few weeks. If and when we get an actual date I will be posting much more about the event, the photos, and Mr. Blaustein on this site and others. Next week November 4th will mark the 46th anniversary of this tragic event. I have a lot of photographs and some personal stories to publish that I received last year from people who found this blog for the first time and got in touch with me personally. I look forward to publishing more of them in the coming days, and also posting any news and scheduled events I can find that will commemorate the flood this year.